Traumatic Brain Injuries (TBI) are a leading cause of death and disability in the United States. As reported by the Centers for Disease Control and Prevention (CDC), about 1.7 million people suffer a traumatic brain injury each and every year. Many of those are seriously injured, as the CDC notes that TBI’s constitute a third of all injury related deaths in the U.S. Our TBI Lawyers are here to help you! 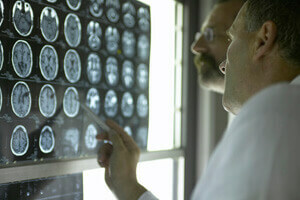 Car accidents are the leading causes of traumatic brain injuries. Brain injuries can occur when the head strikes an object, such as a windshield. Sometimes brain injuries result from whiplash, which is a sudden acceleration/deceleration movement without any direct external trauma to the head. Many brain injuries are the result of bruising, bleeding, twisting or tearing of the brain tissue. Damage to the brain may occur not only at the time of the accident but also over time as tissues swell and bleed within the head. Traumatic brain injuries may lead to permanent or temporary impairment of the brain’s functions. They can leave the victim in varying states of debilitation. Blunt trauma may cause the victim’s brain to swell, bruise or tear. Prolonged lack of oxygen, or an “anoxic brain injury” can also have severe and life-threatening consequences. This type of traumatic brain injury causes the brain cells to die from a lack of oxygen. The National Center for Injury Prevention and Control notes that children under 4 years old, adolescents between the ages 15 and 19, and the elderly are the most susceptible to a TBI. Everyone at your firm was very personable, caring, and diligent. Your amazing work was evident every step of the way, and for that I cannot thank you enough. From the very beginning I felt like everyone actually cared deeply about our situation, and it made the entire process much less stressful than I thought it would be. Please accept our warmest thanks. We will be sure to recommend your team to anyone who is in need of legal help. Testimonial from Jenice W.
Brain injury cases can be very complex, so consult with a traumatic brain injury lawyer before pursuing your TBI lawsuit. These types of cases require both legal and medical expertise. It is vital to have legal help at these times from a team of TBI lawyers with the experience and resources to do all that is necessary to ensure your interests are protected. The Rothenberg Law Firm LLP has a nationwide bank of experts with the ability to evaluate the traumatic brain injury and present qualified medical expert opinion at trial together with the diagnosis, prognosis, and causal connection of the injury to the accident. We also have a national team of forensic economists who are prepared to substantiate and project future loss as well as current and prior economic loss. You want a traumatic brain injury attorney and firm that is prepared to expend the necessary resources to ensure no stone is left unturned. Our firm has been in practice for over 49 years, collecting hundreds of millions of dollars for thousands of clients with an experienced team of head injury lawyers. We have the demonstrated record of competence, ability, and stability to be there for you in these stressful times. If you or a loved one has suffered a traumatic brain injury, call a traumatic brain injury lawyer at The Rothenberg Law Firm LLP at 1-800-624-8888 or submit a free online case evaluation. The initial consultation with a head injury attorney is FREE. If we agree to handle your case, there is no legal fee unless we are successful in getting you money. A lawsuit must be filed before an applicable expiration date, known as a Statute of Limitations so please contact our brain injury law firm right away so that you do not lose your rights to money and other benefits.